Although your roof may currently be supporting the weight of the snow, if you climb onto your roof, you may find that you’re the proverbial straw that breaks the camel’s back. Remember, wet snow weighs more than dry snow and ice weighs the most; it’s not the number of inches of snow to worry about but the weight. A good guideline to follow to know when to clear is about every foot of snow, and more often if you have ice dams. If you have heated gutter systems, you generally don’t have to worry about ice. One of the warnings on every ladder is to make sure there is a level surface on which to place it. If you’re cleaning snow from your roof, chances are good there’s snow on the ground. This makes it nearly impossible to put the ladder on level ground. If you do find a level sidewalk or driveway, watch out for ice that will cause the ladder to slip. 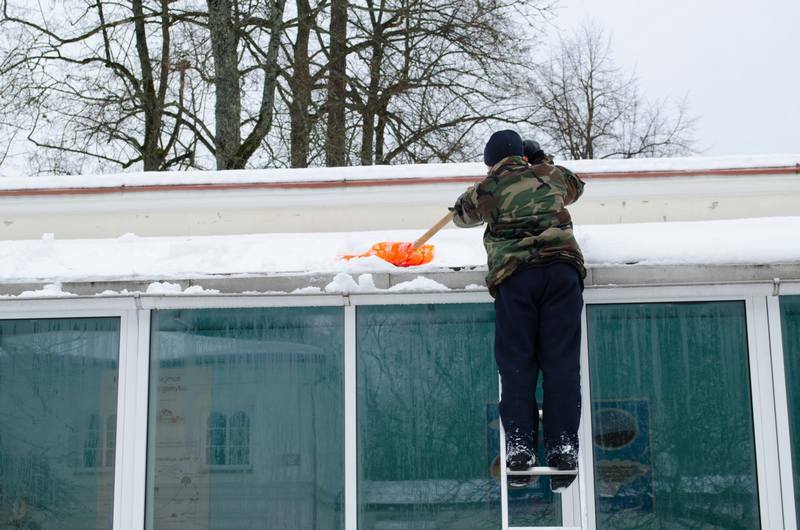 A snow rake is the ideal tool with which to clean a roof. If you’re on the roof and use a shovel, you risk going too deep and scraping the granules off your shingles, which can eventually lead to a roof leak. If you’re on the ground and use a regular metal rake, you could do damage to your shingles and roof gutter covers. If your spouse or neighbor is standing beneath you and the snow you rake off causes an avalanche, they may be injured. Be aware of kids playing in the area and make sure they don’t come close enough to be covered in falling snow. If you’re haphazardly shoveling and throwing the snow off the roof and end up hitting a car or your landscaping, you could also be left with damage. Pay attention to what you’re doing and who is around. Because ice is significantly heavier than snow, it’s important to prevent ice dams on your roof. Roof gutter covers and heated gutter systems help prevent ice dams from forming. If you haven’t looked into one or both of these tools and your home is prone to ice dams, contact your local Gutter Helmet® dealer. 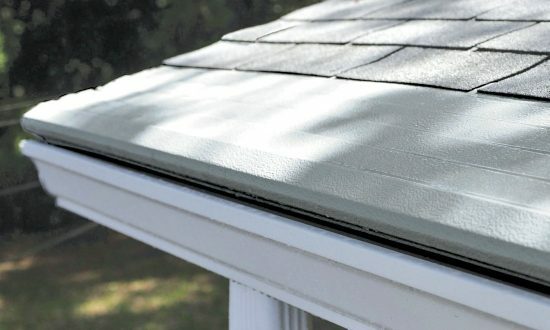 They can share with you the many benefits of gutter covers and Helmet Heat®. Call (800) 824-3772 and we’ll get you in touch with your local dealer.